This little detour into the Lakelands had one big disadvantage: it was mostly along busier roads which was quite a shock after Karelian side roads with hardly any traffic. First sightseeing stop was Kerimäki with the world's biggest wooden church. The church is huge but otherwise quite unimpressive which doesn't deter hundreds of tourists to visit it. Much more interesting was the Savolinna museum where you can see how parishioners got to church. In the Lakelands going by boat was the natural choice - and this church boats were huge! Some of these rowing boats carried up to 150 people. Church goers did this boat trip in their underwear and only changed into their Sunday clothes once ashore. 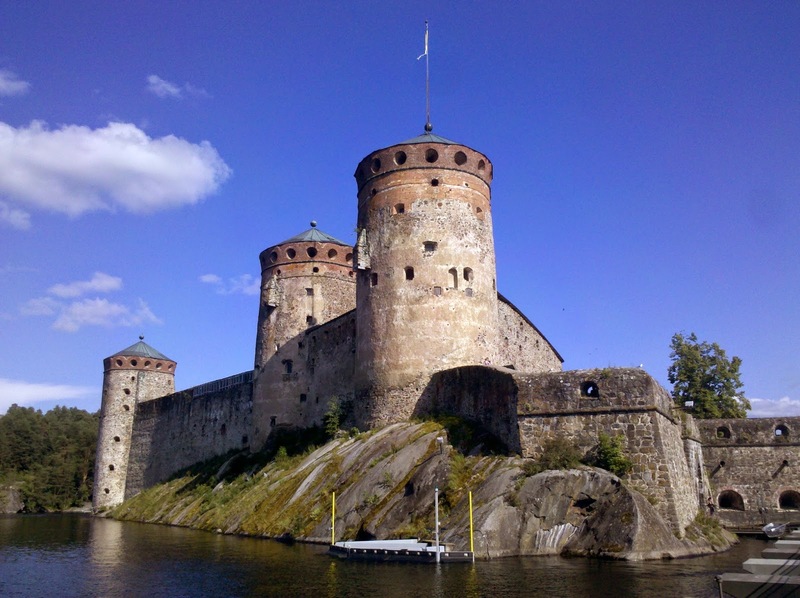 The most famous sight in Savonlinna is the castle which hosts a huge opera festival in summer. The castle is built onto an islands and can only be reached by a bridge. This led to an unusual problem for bike-friendly Finland: where to park the bicycle. Bicycles were forbidden on the castle island and there wasn't even a luggage storage - only champagne bars for opera visitors. The friendly guy at the ticket counter tried to help me but couldn't come up with a solution either. In the end he asked me to write an email to the city council and complain about the lack of bike storage as I wasn't the first one with this problem. I parked outside and left my panniers on the bike which made me feel totally uneasy during the guided your through the castle. Like every other mediaeval castle in Scandinavia this one was quite impressive from outside - and rather boring from inside. Whenever we passed a window I tried to get a glimpse of my bike. In the end I got so nervous that I left the tour early to leave the castle - and stood in front of water were an hour earlier a bridge had been. I nearly panicked until I realised that this was a moveable bridge which had only opened to let a boat pass. Five minutes later I was happily reunited with my bicycle that hadn't been touched by anyone.... I tried to calm down by sitting on a park bench and watching the first opera goers in their elegant and sometimes quirky evening dresses. Next day was Lusto day. Lusto is the huge Finnish forestry museum and I wanted to get my 10 € entrance fee's worth out of it. Lusto is a real museum highlight and I spent 5 hours there. 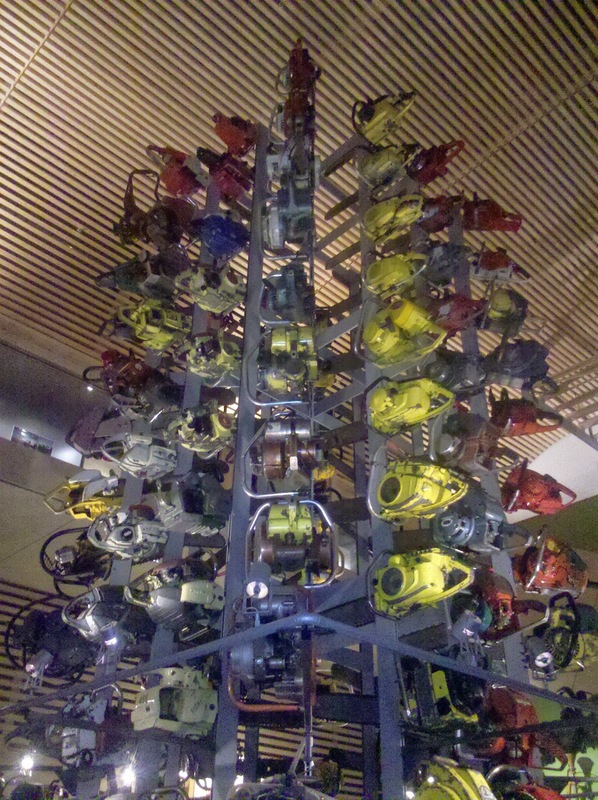 The exhibition covers every possible aspect of forest from history to machinery and from wolves to elves. I was most impressed by a tree consisting of dozens of chainsaws and even tried my luck in a tree loader where I realised that I'd be a lousy forest worker. Due to the swampy ground tree harvesting season in Finland is winter when the ground is frozen and the trees could be transported on sleds. Workers lived in huts in the woods in very primitive conditions. Back in the 50's wood and wood products made up over 70% of Finnish exports. Nowadays it is only around 20% - but still an important number. I spent so much time in the museum that I almost had to rush to get my designated camp spot: Siikalathi wetlands and bird viewing area. I admit that I was lured there not so much by the birds but by the campfire site: it was grill sausage time again! I arrived late at this nature reserve and immediately lit a campfire. I was just eating my second sausage when at 10 pm some late visitors arrived: a group of Russian tourists. They left when I ate my fourth sausage.... As I had the whole place to myself now I slept in the information hut - a nice change from being in my tent all the time. In the morning - when I wasn't distracted by grill sausages any more - I finally took a look at the nature reserve. I am not into birding but even I was impressed with this place. 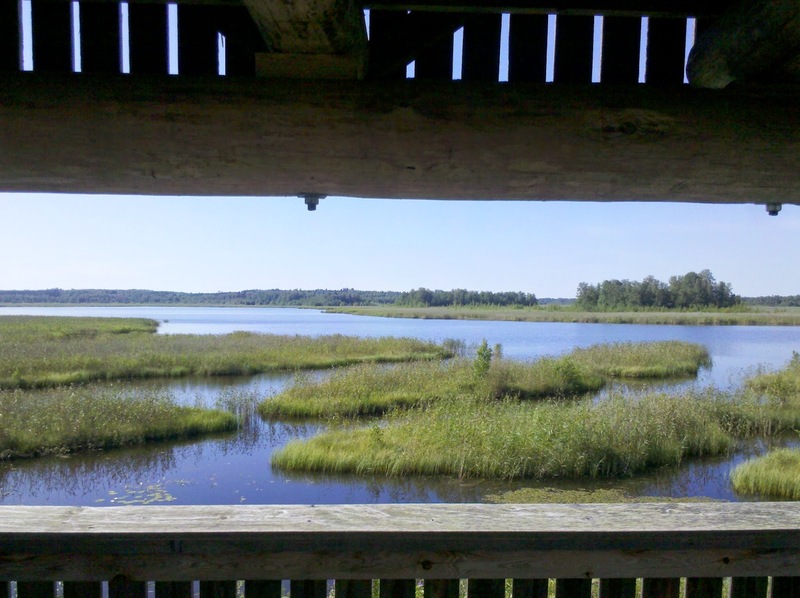 The wetlands are an important stop for migrating birds and in spring this place must be crowded with birds and birdnuts. But even now in July it was fascinating. There were two bird viewing towers and an elaborate bird hide where even I managed to see an abundance of birds. I stayed so long that I had to rush to get into Imatra before Lidl closed at 6 pm on Sundays - and I needed food! I shouldn't have worried: next to Lidl were several other supermarkets with longer opening hours, all caring for Russian tourists. Even Lidl had a "tax free for tourists" counter - and this was one of the biggest Lidls I have ever seen. The negative side effect of all the Russian tourists is that the usual supermarket toilets here all cost money - normally they are free and a great way for dirty cyclists to "freshen up". Lappeenranta was next and again the whole place was full of Russian tourists - and tourists wanting to go to Russia. The reason is a visa loophole: from Lappeenranta can take cruises on the Saaima canal to Vyborg in Russia - without a visa. 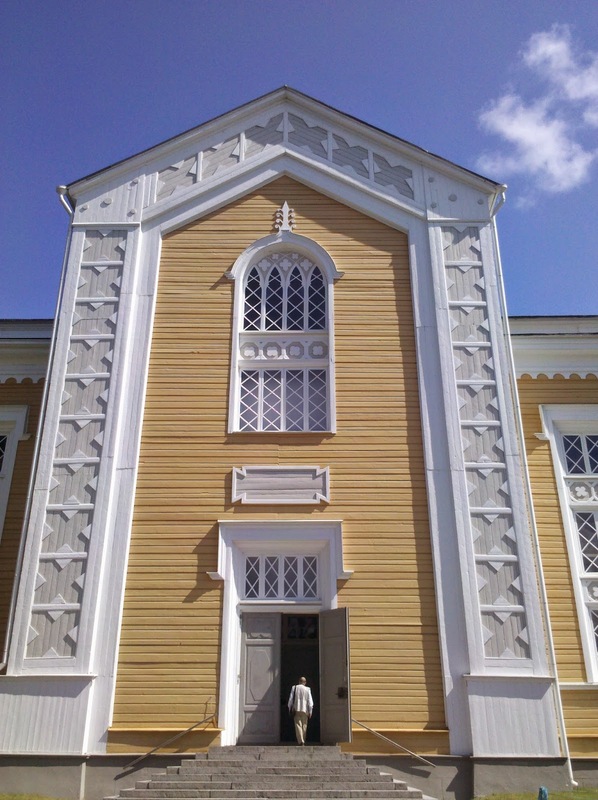 Vyborg was Finnish before WW II and is now the major theme in Lappeenranta's South Karelian museum. The EV route took me into town along the Saaima canal where I saw some pretty impressive looks. 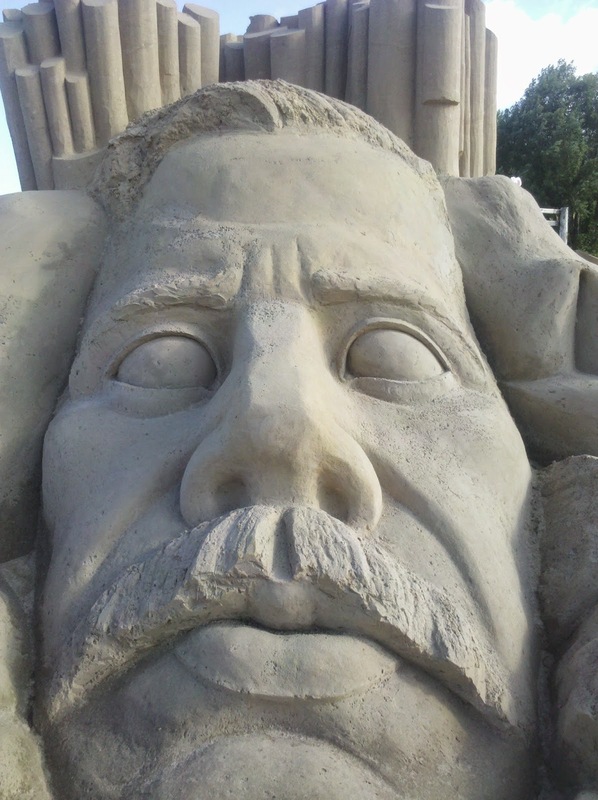 Lappeenranta's summer attraction is the sand castle park where each year several sand sculptures are erected. This year's theme must be music as I saw Jean Sibelius next to Freddy Mercury. Had the weather been unusually cold around midsummer it was now unusually warm, almost hot. For over two weeks now it was blue sky every day and temperatures up to 30° Celsius. I jumped into every lake along the way and the water in the shallow lakes was almost lukewarm. 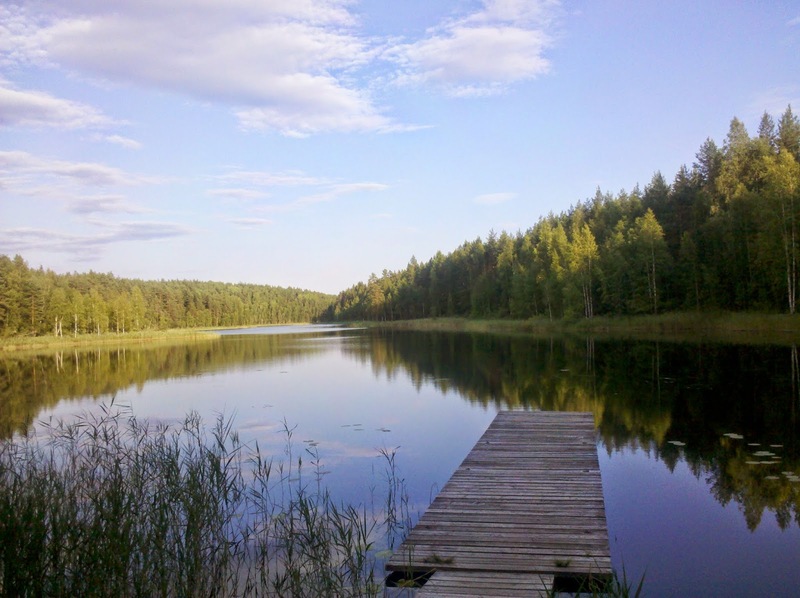 It had been so hot and dry that South Karelia had issued a forest fire warning. The long term forecast was for more warm weather and I wanted to take advantage of that. 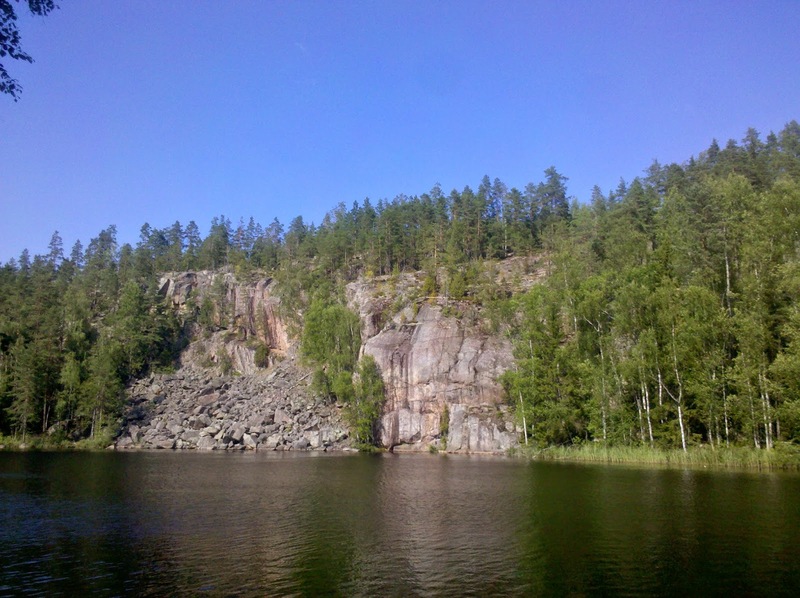 I decided to leave the EV route and make a detour to Repovesi National Park. 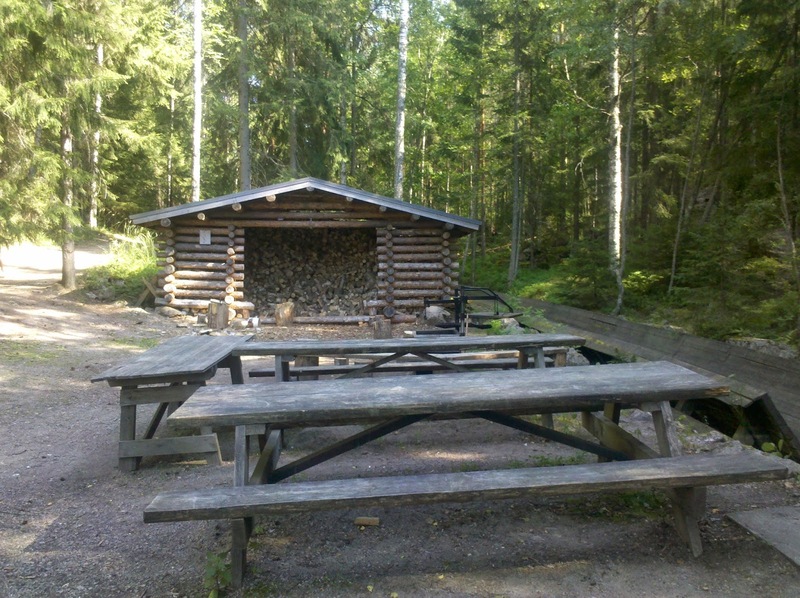 I openly admit that I like Finnish National Parks and nature reserves not only for their nature but also for their campfire sites (think grill sausage) and other installations. Repovesi was especially good since you are allowed to cycle on the forest roads which takes you to or very close to most sites and sights including several swimming beaches. This sounded like the perfect spot for a well needed rest day. I therefore bought two packages of grill sausages and set out. When I arrived at the park I immediately realised that I was not the only one thinking that this is a great spot for a break. The parking lot was full of cars (with lots of Russian licence plates) and the first campfire site was already full. I cycled on. Next campfire site was also occupied with two tents and the campfire was already going - and nobody paying attention to it. My hunger for grill sausages was sort of urgent now and I therefore just took over the fire. Half an hour later I had demolished for sausages and felt much better when a Russian family appeared fully loaded with camp chairs, coolers and barbecue equipment. I fled. Luckily I had already discovered the perfect campsite next to a little lake. It was just off a maintenance road where no one else went except a cyclist - everybody else is using the trails. I spent a peaceful night - no Russian families, only loons. The very best was that it had morning shade - very important when sunrise is at 3 am and you want to sleep in. At noon I finally left my shady campsite to explore the park. I soon figured out that the maintenance road did indeed get me anywhere but that it was hard, hard work. Steep ascents on loose gravel made me push the bike more than pedal. Luckily this is a small park! I soon reached a popular picnic spot where the campfire was already burning. While I barbecued my sausages I watched in amazement how two voluptuous Russian teenage girls tried to chop wood with a huge axe - clad only in tiny bikinis. They weren't even wearing shoes. They weren't very successful and soon their group leader came to their rescue - in true Putin style only wearing swimming trunks and a gold chain. So much for work safety. At least I put my bike into a safe distance from this looming disaster. 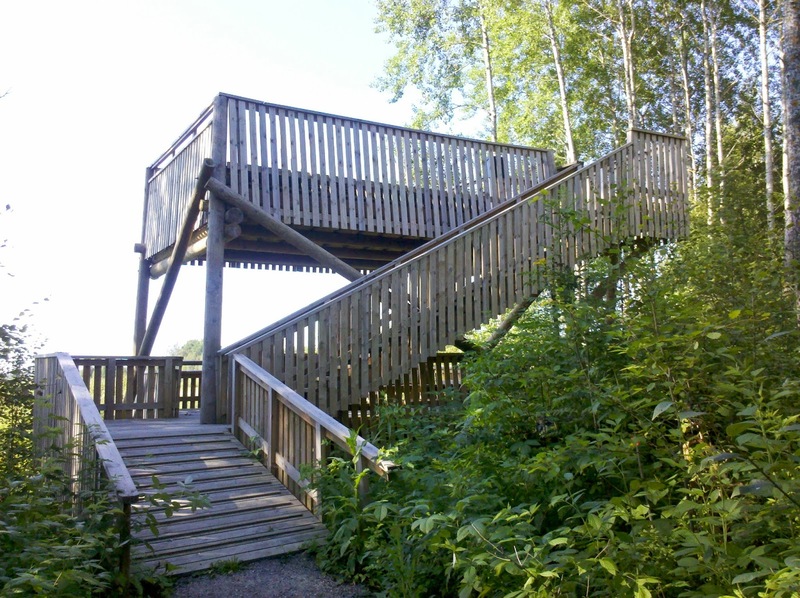 The park even boasts a viewing tower, something rare in flat Finland. I soon regretted going there on the steep forest road but I could soon wash off my sweat in a lake. The park was almost too crowded for my taste: Russian tourists, Finnish families in a hiking trip, mountain climbers, mountain bikers - and everybody was eating grill sausage. I returned to my stealth campsite where I knew I wouldn't have noisy company. But still: it had been a good restday and I had now planned out the rest of my route through Finland.